We can see that understanding elasticity helps a firm set a price that maximizes total revenue. What happens if the firm’s production costs change, though? And what is the impact on customers? Most businesses are continually trying to figure out ways to produce at a lower cost, as one path to earning higher profits. It’s a challenge to do this, though, when the price of a key input over which a firm has no control rises. For example, many chemical companies use petroleum as a key input, but they have no control over the world market price for crude oil. Coffee shops use coffee as a key input, but they have no control over the world market price of coffee. If the cost of a key input rises, can the firm pass along those higher costs to consumers in the form of higher prices? Conversely, if new and less expensive ways of producing are invented, can the firm keep the benefits in the form of higher profits, or will the market pressure them to pass along the gains to consumers in the form of lower prices? The price elasticity of demand plays a key role in answering these questions. Figure 1. Pills and Production. 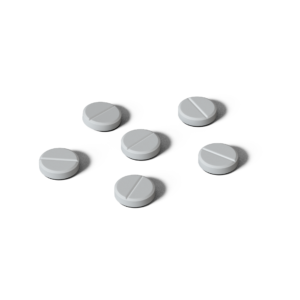 Consider how a technological breakthrough in aspirin production would impact the market if it were inelastic and if it were elastic. Imagine that, as a consumer of legal pharmaceutical products, you read a news story about a technological breakthrough in the production of aspirin: now every aspirin factory can make aspirin more cheaply than it did before. What does this discovery mean to you? Figure 2 illustrates two possibilities. In Figure 2(a), the demand curve is highly inelastic. In this case, a technological breakthrough that shifts supply to the right, from S0 to S1, so that the equilibrium shifts from E0 to E1, creates a substantially lower price for the product with relatively little impact on the quantity sold. In Figure 2(b), the demand curve is highly elastic. In this case, the technological breakthrough leads to a much greater quantity sold in the market at very close to the original price. Consumers benefit more, in general, when the demand curve is more inelastic because the shift in the supply results in a much lower price for consumers. Figure 2. Passing along Cost Savings to Consumers. Cost-saving gains cause supply to shift out to the right from S0 to S1; that is, at any given price, firms will be willing to supply a greater quantity. If demand is inelastic, as in (a), the result of this cost-saving technological improvement will be substantially lower prices. If demand is elastic, as in (b), the result will be only slightly lower prices. Consumers benefit in either case, from a greater quantity at a lower price, but the benefit is greater when demand is inelastic, as in (a). Producers of aspirin may find themselves in a nasty bind here. The situation shown in Figure 2, with extremely inelastic demand, means that a new invention may cause the price to drop dramatically while quantity changes little. As a result, the new production technology can lead to a drop in the revenue that firms earn from sales of aspirin. However, if strong competition exists between producers of aspirin, each producer may have little choice but to search for and implement any breakthrough that allows it to reduce production costs. After all, if one firm decides not to implement such a cost-saving technology, it can be driven out of business by other firms that do. Since demand for food is generally inelastic, farmers may often face the situation in Figure 2(a). That is, a surge in production leads to a severe drop in price that can actually decrease the total revenue received by farmers. Conversely, poor weather or other conditions that cause a terrible year for farm production can sharply raise prices so that the total revenue received increases. The example below discusses how these issues relate to coffee. Coffee is an international crop. The top five coffee-exporting nations are Brazil, Vietnam, Colombia, Indonesia, and Guatemala. In these nations and others, 20 million families depend on selling coffee beans as their main source of income. These families are exposed to enormous risk, because the world price of coffee bounces up and down. For example, in 1993, the world price of coffee was about 50 cents per pound; in 1995 it was four times as high, at $2 per pound. By 1997 it had fallen by half to $1.00 per pound. In 1998 it leaped back up to $2 per pound. By 2001 it had fallen back to 46 cents a pound; by early 2011 it went back up to about $2.31 per pound. By the end of 2012, the price had fallen back to about $1.31 per pound. The reason for these price fluctuations stems from a combination of inelastic demand and shifts in supply. The elasticity of coffee demand is only about 0.3; that is, a 10% rise in the price of coffee leads to a decline of about 3% in the quantity of coffee consumed. When a major frost hit the Brazilian coffee crop in 1994, coffee supply shifted to the left with an inelastic demand curve, leading to much higher prices. Conversely, when Vietnam entered the world coffee market as a major producer in the late 1990s, the supply curve shifted out to the right. With a highly inelastic demand curve, coffee prices fell dramatically. This situation is shown in Figure 2 (a), above. Get some more practice applying elasticity in the real world by watching the following video about what happens to the housing rental market (and the prices you would pay for rent) depending on whether or not demand is elastic or inelastic. Elasticity also reveals whether firms can pass higher costs that they incur on to consumers. Addictive substances, for which demand is inelastic, are products for which producers can pass higher costs on to consumers. For example, the demand for cigarettes is relatively inelastic among regular smokers who are somewhat addicted. Economic research suggests that increasing cigarette prices by 10% leads to about a 3% reduction in the quantity of cigarettes that adults smoke, so the elasticity of demand for cigarettes is 0.3. If society increases taxes on companies that produce cigarettes, the result will be, as in Figure 3(a), that the supply curve shifts from S0 to S1. However, as the equilibrium moves from E0 to E1, producers mainly pass along these taxes to consumers in the form of higher prices. These higher taxes on cigarettes will raise tax revenue for the government, but they will not much affect the quantity of smoking. If the goal is to reduce the quantity of cigarettes demanded, we must achieve it by shifting this inelastic demand back to the left, perhaps with public programs to discourage cigarette use or to help people to quit. For example, anti-smoking advertising campaigns have shown some ability to reduce smoking. However, if cigarette demand were more elastic, as in Figure 3 (b), then an increase in taxes that shifts supply from S0 to S1 and equilibrium from E0 to E1 would reduce the quantity of cigarettes smoked substantially. Youth smoking seems to be more elastic than adult smoking—that is, the quantity of youth smoking will fall by a greater percentage than the quantity of adult smoking in response to a given percentage increase in price. Figure 3. Passing along Higher Costs to Consumers. Higher costs, like a higher tax on cigarette companies for the example given in the text, lead supply to shift to the left. This shift is identical in (a) and (b). 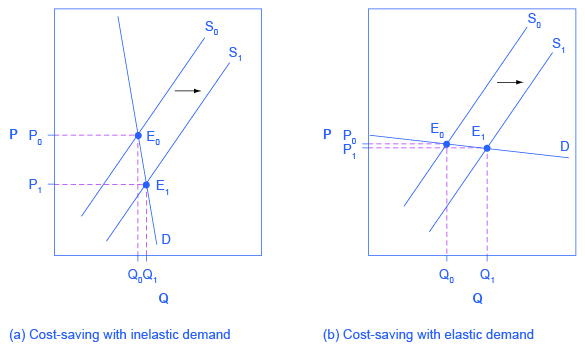 However, in (a), where demand is inelastic, the cost increase can largely be passed along to consumers in the form of higher prices, without much of a decline in equilibrium quantity. In (b), demand is elastic, so the shift in supply results primarily in a lower equilibrium quantity. Consumers suffer in either case, but in (a), they suffer from paying a higher price for the same quantity, while in (b), they suffer from buying a lower quantity (and presumably needing to shift their consumption elsewhere). Elasticities are often lower in the short run than in the long run. On the demand side of the market, it can sometimes be difficult to change Qd in the short run but easier in the long run. Consumption of energy is a clear example. In the short run, it is not easy for a person to make substantial changes in his or her energy consumption. Maybe you can carpool to work sometimes or adjust your home thermostat by a few degrees if the cost of energy rises, but that’s about it. However, in the long-run you can purchase a car that gets more miles to the gallon, choose a job that is closer to where you live, buy more energy-efficient home appliances, or install more insulation in your home. As a result, the elasticity of demand for energy is somewhat inelastic in the short run, but much more elastic in the long run. Figure 4 shows an example, based roughly on historical experience, of the responsiveness of Qd to price changes. In 1973, the price of crude oil was $12 per barrel, and total consumption in the U.S. economy was 17 million barrels per day. That year, the nations who were members of the Organization of Petroleum Exporting Countries (OPEC) cut off oil exports to the United States for six months because the Arab members of OPEC disagreed with the U.S. support for Israel. OPEC did not bring exports back to their earlier levels until 1975—a policy that can be interpreted as a shift of the supply curve to the left in the U.S. petroleum market. Figure 4(a) and (b) show the same original equilibrium point and the same identical shift of a supply curve to the left from S0 to S1. Figure 4. How a Shift in Supply Can Affect Price or Quantity. The intersection (E0) between demand curve D and supply curve S0 is the same in both (a) and (b). The shift of supply to the left from S0 to S1 is identical in both (a) and (b). The new equilibrium (E1) has a higher price and a lower quantity than the original equilibrium (E0) in both (a) and (b). However, the shape of the demand curve D is different in (a) and (b). As a result, the shift in supply can result either in a new equilibrium with a much higher price and an only slightly smaller quantity, as in (a), or in a new equilibrium with only a small increase in price and a relatively larger reduction in quantity, as in (b). Figure 4(a) shows inelastic demand for oil in the short run similar to that which existed for the United States in 1973. In Figure 4(a), the new equilibrium (E1) occurs at a price of $25 per barrel, roughly double the price before the OPEC shock, and an equilibrium quantity of 16 million barrels per day. Figure 3(b) shows what the outcome would have been if the U.S. demand for oil had been more elastic, a result more likely over the long term. This alternative equilibrium (E1) would have resulted in a smaller price increase to $14 per barrel and larger reduction in equilibrium quantity to 13 million barrels per day. In 1983, for example, U.S. petroleum consumption was 15.3 million barrels a day, which was lower than in 1973 or 1975. U.S. petroleum consumption was down even though the U.S. economy was about one-fourth larger in 1983 than it had been in 1973. The primary reason for the lower quantity was that higher energy prices spurred conservation efforts, and after a decade of home insulation, more fuel-efficient cars, more efficient appliances and machinery, and other fuel-conserving choices, the demand curve for energy had become more elastic.